It was a bad idea to let the community decides which nations to add. You can expect this community where chauvinistic feelings are rampant to vote rationally for the most logical and "best" options. And i think too many voters werent well informed enough about all the possible options to make such decisions. Heck, even Eugen i am sure didnt expect those poll results. I recall MadMat saying that he had expected people to vote massively for Italy because it was clearly one of the best options... that didnt happen. Because voters "reasons". Again, adding more blue nations when they already outnumber red nations 2:1 is hardly the "logical" or "best" option. Uh? I was all in favor of adding more Red nations. I already mentioned that Romania and Bulgaria would have been two good additions to the game, especially Romania. But look how few votes they got in the poll... Still think it was a good idea to let the community decide? NATO countries have a history of expeditionary deployments. Several Western European countries and Canada took part in the Korean War and not just in a non-combat role so its not particularly implausible to imagine them taking part in a major war in Asia. Finland, however, is completely out of place in RD. For numbers at the end summer '51 there were 302 000 americans, 14 000 brits, 6 000 canadians, 5500 turks (!) as well as several medical units (154 from sweden, 105 from norway, 72 from italy and 70 from india) in korea. It's a bit dishonest to say that a complete norwegian mechanized division in active combat in korea with several flights worth of combat aircraft in '82 is realistic because of their history of "expeditionary deployment" in korea in the 50's which relied completely on american logistics, air defence, artillery, air support, food, ammo and intelligence. And i had more than Korea in mind when i said a history of "expeditionary deployment". Like the Western/NATO deployments in the Gulf & and the Balkans in the early 90s. France sent a full division (Division Daguet) including tanks in the Gulf during Desert Storm and took an active part in the ground phase of the war. It demonstrated that were willing and capable of sending significant forces abroad to take part in a major war far away from their borders. This is again another precedent... In the case of Germany and Italy, it was more political reasons than anything else that prevented them from sending ground forces though Italy sent some air assets (Tornados). Last edited by ST21 on Wed 4 Apr 2018 12:08, edited 1 time in total. I never thought I'd defend the Finns, but the irony of this all compels me. Sleksa wrote: For numbers at the end summer '51 there were 302 000 americans, 14 000 brits, 6 000 canadians, 5500 turks (!) as well as several medical units (154 from sweden, 105 from norway, 72 from italy and 70 from india) in korea. It's a bit dishonest to say that a complete norwegian mechanized division in active combat in korea with several flights worth of combat aircraft in '82 is realistic because of their history of "expeditionary deployment" in korea in the 50's which relied completely on american logistics, air defence, artillery, air support, food, ammo and intelligence. Your forgetting the 18,000 ANZAC soldiers that fought during the Korean War and the thousands soldiers from countries neither in NATO or Warsaw Pact that were their also. Italy was one of the founding countries if NATO. ST21 wrote: Uh? I was all in favor of adding more Red nations. I already mentioned that Romania and Bulgaria would have been two good additions to the game, especially Romania. But look how feg tes they got in the poll... Still think it was a good idea to let the community decide? I think Romania and Bulgaria would be just like Finland using exported equipment with no local vehicle designs except a new attack helicopter. Last edited by Pixel Ninja on Tue 13 Mar 2018 19:07, edited 5 times in total. I fail to see the irony. Not all minor nations are equal. Some have genuinely more to offer than others. Btw, not sure i would consider Finland a 'minor nation' given the way it was modelled... I would say it is right there at the border between minor and major. I concede that Bulgaria has less to offer and in many ways looks like a copy-paste of USSR. Still, there were ways to make it a bit less generic. I wouldnt have minded to see them added to help complete the WarPac faction though they werent my first choice for a new Red nation. Last edited by ST21 on Tue 13 Mar 2018 20:14, edited 4 times in total. Pixel Ninja wrote: I think Romania and Bulgaria would be just like Finland using exported equipment with no local vehicle designs except a new attack helicopter. Well this is indeed the case for Bulgaria that has only the BMP-23 IFVs and recon vehicles (the latter is proto) which are pretty much worse BMP-2s with a 23mm gun and a Faktoryia (the use of this missile is however unique in NSWP IRL). The otherall roster is actually okay for NSWP but doesn't bring much aside of the roleplaying aspect. Romania thought is anover story especially if you introduce prototypes since she actually produced a few indigenous variantes of existing Soviet equipment as well as fully indigenous units. Transports are not that original with reengined and BTR-60s and 70s with new turret (the first is in the game as the TAB-71M), a BMP-1 with a better engine and a secondary Dshk HMG (MLI-84) (note however that modernized prototypes with 20 to 30mm ACs existed in the late 80s), a BTR-80 (ITF unlike other NSWP countries that never had it), the MLVM which is a shorter BMP-1 like hull with a KPVT turret for mountain units, and the TABC-79 which is a shorter BTR-77 with a new engine and turret for recon units. They however have french Puma helicopters (IAR-330). Tanks are however quite unique tanks outside of the T-55A and T-55AM (with indigenous FCS), such as the TR-580 which is a T-55 with a streched hull and much thicker armor (320mm on the turret, 200mm on the hull front) and a modified 100mm gun; the TR-85 which is a modernized variant fitted with the engine of the Leopard 1 giving it a 60kph top speed and a modern FCS (1985/6 so definitly ITF). And the most glorious of all, the TR-125, an improved T-72 prototype with a 880hp engine, a streched hull, composite armorand a new 125mm gun on op of a new FCS and other improvements hat can't be modeled ingame (laser warner for example). And these are only examples, check steppenwolfRO's thread for further data. ST21 wrote: "Given all this, why would people want this nation added?" the more rational side of me thought. Well, the rest is history and here were are now with a completely unrealistic portrayal of Finnish Defence Forces circa 1991 with a heavy reliance on OOTF prototypes, fantasy units (R-77-armed MiG-29, fictional mortar carriers, Telak 84, Mi-8 gunship, MD500 TOW...) and meme units in order to make it a viable nation. While all armies in the game arent perfect representations of their real world equivalents, Finland is by far the less accurately represented nation. I am more or less OK with the addition of Israel & Yugoslavia (with some reservations) but Finland is a big thumb down for me. It damaged the "realistic" setting of the game and the immersion and suspension of disbelief suffered as a result. Poor decision. True about South Korea not getting any T-80s ingame, if Egypt were to be added they might have gotten M1 Abrams. I don’t find that fair at all. The previous few posts remind me of the issues that come about when nations have to be "viable" to be included. I venture the opinion that while nations probably should have strengths and IRL those strengths could be emphasized through things such as vet/availability for flavour, they should be left with their weaknesses even if that makes them unsuitable for use as a standalone. I personally believe it is worth it to model and impliment a nation even if it only brings one or two viable spec decks to the table, that's flavor enough. Polish airborne and Norwegian mech from ALB are some that come to mind. It's unfortunate but mid way through RD the expectation came about that minors, especially dlc minors, would be competitive in most of the key metrics previously fulfilled only by superpowers and coalitions, I think the nation design philosophy lost its way in this respect. Not every nation needs to be viable for 1v1s. "Given all this, why would people want this nation added?" the more rational side of me thought. Well, the rest is history and here we are now with a completely unrealistic portrayal of Finnish Defence Forces circa 1991 with a heavy reliance on OOTF prototypes, fantasy units (R-77-armed MiG-29, fictional mortar carriers, Telak 84, Mi-8 gunship, MD500 TOW...) and meme units in order to make it a viable nation. While all armies in the game arent perfect representations of their real world equivalents, Finland is by far the less accurately represented nation. I am more or less OK with the addition of Israel & Yugoslavia (with some reservations) but Finland is a big thumb down for me. It damaged the "realistic" setting of the game and the immersion and suspension of disbelief suffered as a result. Poor decision. There are indeed some issues. Some of them are however clearly due to lack of non-Finnish sources for the development of the military hardware - and the scarcity of Finnish pictured sources also. Tampella was a huge player in indirect fire systems, and the Israeli Soltam was a subsidiary of Tampella until 1974, and that's a reason for a lot of the Finnish mortars/artillery in the game. The TELAK 84 could have been replaced with the 122 K 60 installed on M4 Sherman chassis (122 TELAK 60, although this designation was never officially used) in the joint Tampella-Soltam development trials in 1966 (which were also FDF observed trials as well as IDF) - as that was a real, firing prototype and would have fit the time frame really well. The 122 K 60 had a remarkably long firing range for a 122 millimetre gun-howitzer, maximum being 26.7 km. Also, as the Tampella 155 K 68 (however FDF just ordered trial models of the older Tampella 155 mm series, unlike the 122 K 60 which was introduced into service properly) was the same gun as the Soltam M-68 and the L-33/Ro'em using the 155 KAN 68, which however entered only Israeli service, was a joint Finnish-Israeli development project too, so it would have been better than the TELAK 84/Sholef. Even later development, while Tampella and Soltam still continued their joint development, was an SPH named M-72, this time with a proper, rotating turret. 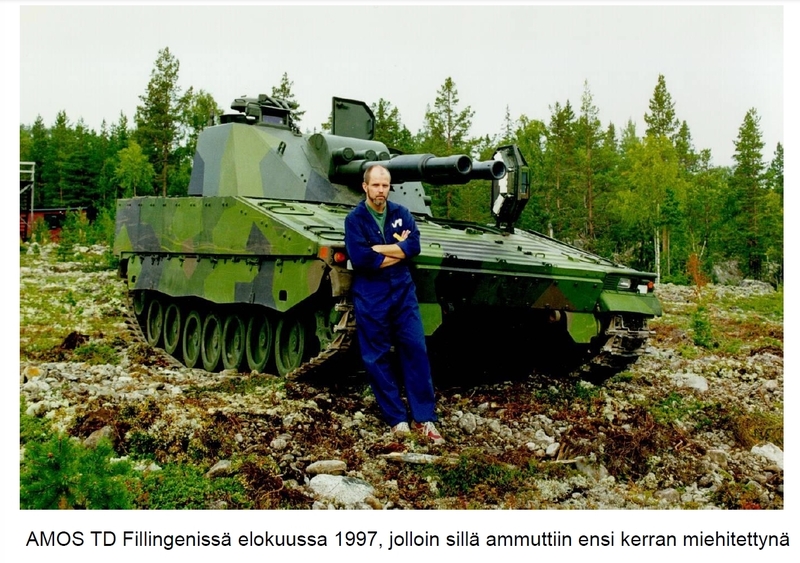 This was taken into service in neither Finland nor Israel, so it stayed as a Soltam prototype. The system was actually just a turret, which was able to be installed on many existing MBT chassis, and it was trialled in Israel on the Centurion chassis. It was originally supposed to use the 155 K 68/M-68, but the new M-71 with L/39 barrel was installed to it instead. Any of these would have fit Finland much better, as the 122 K 60 was a weapon which really entered FDF service (although the SPH prototype didn't), and the two latter were prototype projects of a Finnish company which were also affliated to FDF. Also, as Soltam and Tampella were officially separated in 1974, those earlier developments would have been a lot more realistic than the 1980's Sholef (although its gun is based on the old Tampella design). Regarding the fictional mortar carriers, there's a slight problem indeed, as the Finnish mortars were usually man-portable/towed. However the 81 KRH 71 is portrayed correctly (although the name is slightly stretched, and it's a 81 mm mortar rather than 82 mm - it couldn't have been TELAKRH, as that means "tracked mortar", it'd have been better just KRH 71), as the mortars indeed are set up ready to fire while transported on truckbed. The current (since the 1980's) custom is to transport the whole mortar platoon on one SA-150, with all three mortars set ready to fire. They are fired from the truckbed if there's no time to set them up correctly on ground. I'm not exactly sure if the Terra is strong enough for this, but substituting the Terra for the SA-150 would have done the trick. The 160 KRH 58-67 (Soltam M-66) isn't either portrayed really unrealistically, as again, Tampella and Soltam prototyped and trialled it together on M4 Sherman chassis - it was incorporated in Israeli service as the Makmat, but then again not into Finnish service, despite FDF taking part in the aforementioned trials in Israel. The ATS-59 chassis is a bit of a stretch AFAIK, but it was properly trialled on another platform. Eugen just took some liberty to introduce a chassis which was properly in FDF service for it. The 120 TELAKRH 84 (MT-LB Podnos) was apparently introduced as Eugen said there wouldn't be articulated vehicles, and it just happens so that the only traditional tracked mortar carriers introduced in the 1980's (Sisu NA-122 with 120 KRH 85 and later 122 KRH 92) were Sisu tracked articulated mortar vehicles. 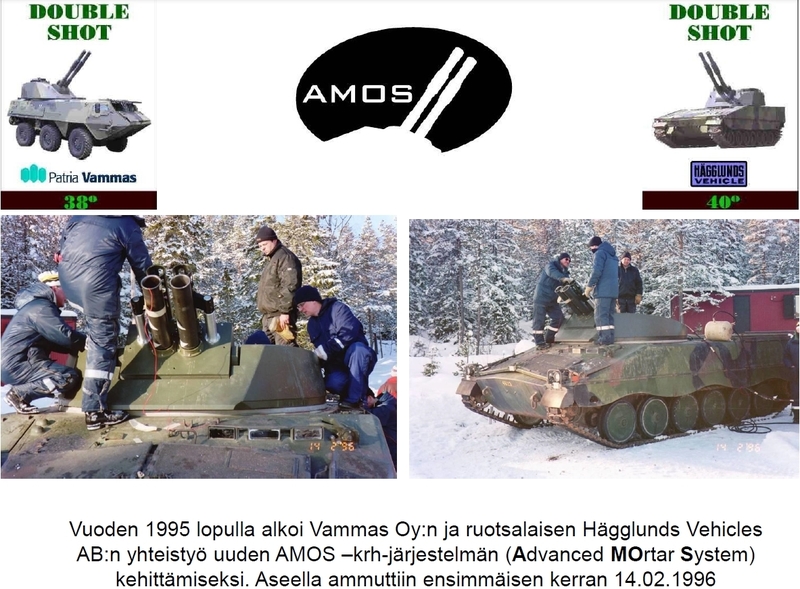 There would have been the AMOS prototype available also, as it was a joint project between Finland and Sweden (and later finished only by Finland when Sweden withdrew from it) - but Eugen decided that the 160 mm mortar was better suited. Also, there'd have been the Finnish WWII-age 120 KRH 40 on Soviet T-26 chassis which was properly in service back then and in storage for later, but that's also slightly out of time frame, and the vehicle itself turned out to be a disappointment, because it couldn't carry enough ammunition, if the whole crew was carried onboard. I've thought about writing a more complete writeup of these on the Finland thread, as I've got pictures also of those early Tampella/Soltam prototypes as well as information from a source within the Finnish mortar/artillery industry. Some pictures I've already posted there, but there's more still. I suppose Eugen knows most of that, but it's interesting nevertheless. The Eugen alternative history is also source of many of the problems as pointed out. Since Finland in RD is based on completely alternative history so it could be integrated into REDFOR, it's no wonder Finland is inaccurately portrayed, as that makes some real late 1980's and 1990's developments incompatible with the ingame storyline, so they had to be altered. If Finland had decided its side in 1992, there would have been just the MiG-29 (and maybe MiG-31, as that was the Soviets'/Russians' final offer to Finland when MiG-29 lost the fighter competition in 1992 - they'd have sold those even in the real history, so they'd have sold those in the alternative history for sure if Finland had really joined the alternative history WP), and then again, in the real history F-18C and F-18D were bought. Similarly, the 220 RAKH 91 (BM-27 Uragan) in Finnish service is completely fictional - although it was already financed for purchase in the late 1980's, as well as more 152 TELAK 91, T-72 based support vehicles, BTR-80 APC's and so on, but those funds were repurposed when USSR fell apart. However it's in the game due to the alternative history. 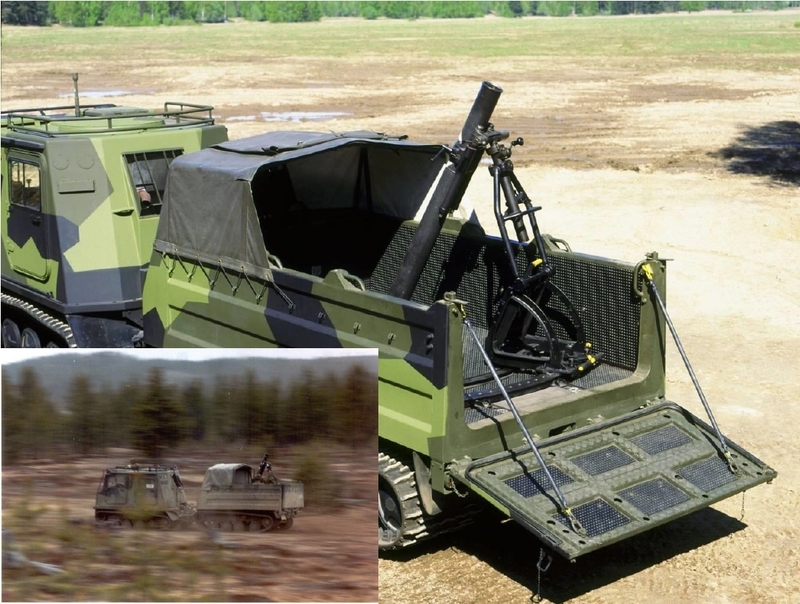 The PSTOHJ 94 (Spike-MR; the system was taken into service in Finland 6 years later as the PSTOHJ 2000, nowadays there's just the PSTOHJ 2000M which is the Spike-LR) is in the game to replace the real Finnish newer ATGM infantry, as in reality there have been completely foot-mobile Finnish TOW 2 (PSTOHJ 84) squads since 1985. That would have been a meme unit par exellence. ST21 wrote: Because they didnt know any better... harsh but true. I fail to see the irony. This does not surprise me, at all. Tampella was indeed a fairly massive influence on the world of mortars through shell companies like deutam(deutsche tampella), portam (portugese tampella), tamares in england as well as salgad in luxemburg (selling mortars to sweden still in the 70's) and soltam in israel. The germans have been using a weapon called "tampella" on their mortars in wargame for quite a while now while the american m120/121 is a finnish 120krh62 design sold through soltam as the k6 with the help of some bribery. For a tiny nation the domestic development and design of mortars was/is world class. J0h1F wrote: The Eugen alternative history is also source of many of the problems as pointed out. Since Finland in RD is based on completely alternative history so it could be integrated into REDFOR, it's no wonder Finland is inaccurately portrayed, as that makes some real late 1980's and 1990's developments incompatible with the ingame storyline, so they had to be altered. The obvious decision was to follow a preset guideline laid by the nswp dlc as well as many others on what the original acquisition programs had in mind before the fall of berlin wall/ussr. This is hardly a new perspective since a glance towards blufor already shows this being the case with us having access to things like eurofighters from 2007, caesars from 2008 or tigers from 2000. While on the eastern side we have half of ddr's cat a-inventory never existing or the czech having access to a slovakian post-ussr development with the moderna.